You can trust Dr. Sarah Thompson of Soft Touch Dentistry to perform painless wisdom teeth removal for you or a member of your family. She is a licensed IV Sedation Dentist who carries extensive training in both restorative and cosmetic dentistry, giving patients the opportunity to achieve a healthy and beautiful smile through all stages of life. We are a family dentistry practice that offers a full range of preventative, general, restorative and cosmetic dentistry including teeth extractions and wisdom teeth removal. Our entire team is dedicated to providing you with excellent, personalized care and service to make your visit as comfortable and as pleasant as possible. Wisdom teeth are the set of third molars that are last to erupt and least needed for optimal dental health. Removing wisdom teeth is commonly recommended due to lack of space in the mouth. If there is not adequate space in your jaw to accommodate normal sized wisdom teeth, they can become impacted and painful. Trapped or impacted wisdom teeth can damage your healthy bone and tooth structure, cause bite problems as well as put you at a much higher risk for gum disease. Surgery to remove wisdom teeth is typically the best course of action to prevent these dental problems associated with wisdom teeth. 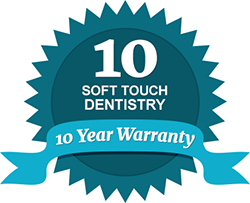 At Soft Touch Dentistry, we treat patients based on their unique dental concerns and specific smile needs. When it comes to wisdom teeth removal, our practice utilizes the latest dental technology available to ensure you gain a fully functional, pain-free and confident smile. We are a unique dental practice that can deliver both oral sedation and IV sedation to our patients. Dr. Thompson is among an elite group of United States dentists licensed to perform IV sedation. Our contemporary office setting also offers amenities such as relaxing music, warm blankets and large screen TVs to keep you as comfortable as possible. For expert, painless wisdom teeth removal, you can trust Soft Touch Dentistry. Our goal is to provide state-of-the-art dental care in the most caring, relaxing environment. Contact us today to schedule a consultation with Dr. Thompson. We work with most dental insurance providers and our office offers flexible financing plans for your convenience. We look forward to helping you achieve and maintain a healthy and functional smile for life!